is the one new artist to watch in country music. The town is small by today’s standards, but it’s large enough for it’s residents. It’s a town where friends and neighbors gather on porches to drink sweet tea and talk about politics. A town where everyone knows your name. But, there is only one name that you need to know from this small town - Brandon Maddox. At a young age, Brandon’s father would spend hours with him sharing what he knew about music. From the legends like Johnny Cash to the hit makers like the Beatles, Brandon learned them all. Although his father had taught him what real music was by such legends, he never inspired him to get into music let alone encourage him to play an instrument. At the young age of eleven, Brandon found an old classical guitar in his Grandfather’s wood shed. At that same time, Brandon would write his first song called “I Told You Yesterday.” The song is written with a very Beatle-esk chord structure. This song would be the first of many for Maddox. Since then he has gone on to write over 850 songs to add to his repertoire. After attending college, Brandon discovered the phenomenon of song writing. At the time, his parent’s encouraged him to stay out of the lime light of being a performer. With the fear of Brandon getting into the down side of the music industry of drugs, his parents encouraged him to be behind the scenes as a song writer. He soon found out that that was where his heart lied. In 2007, Brandon moved to Nashville and things began to happen. He began winning various song contests around Music City. Publishing companies were taking a major interest in his songs. Within nine months of the move, Brandon had a songwriting contract with Faverett Entertainment Group. Soon he was working with Chris Gantry, who wrote many songs for Johnny Cash and Glenn Campbell. In 2011, Brandon Maddox chose to bring his songs to the public by becoming an entertainer. The album also features Maddox’s version of “Honk, If You’re Country,” a song that he co-wrote with Brian Curtis of Curtis & Luckey. It was Curtis & Luckey who originally released the song. However, Maddox is able to capture the true traditional country feel in his version. However, the more notable song on this EP is the title track. Written by Danny Kravitz, this song is sure to touch the hearts of boys of all ages with it’s lyrics that take the listener on a journey through their past childhood. Although the EP features songs written by Maddox, it does not truly show the real songwriter behind the man. 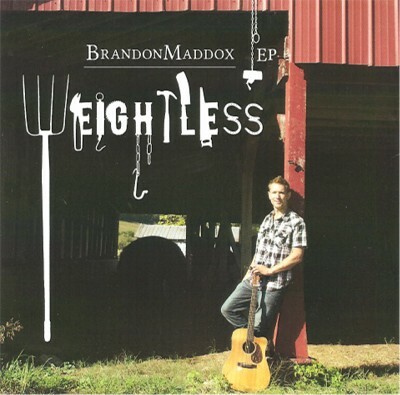 The album that captures the true nature of who Brandon is can be found in his 2014 debut EP called Weightless. In this five cut EP, Maddox gives the listener a taste of what kind of singer songwriter he is. Brandon has this uncanny ability to take the traditional writing styles known by songwriters of the 1960’s and mix them with everyday life to bring forth a song that captures the heart and soul of the listener. The EP opens with the title track, a beautiful love ballad that contains a affrettando beat and a catchy, memorable chorus. In this song one can hear the classic rock influences as Brandon draws from his knowledge and appreciation from the artists of the 1960’s. The album continues with “No Holding Back.” This song starts in a dark mood that makes you feel as if the song were about a break-up. But then the song progresses into a lighter mood of true love. The third cut, “Picture Perfect,” is one of two songs that will hit Strictly Country’s list of Top Songs of 2014. In this perfectly recorded and artistically defined masterpiece, Brandon gives the listener a glimpse of who he is as a man while he relays the message of how the love of his life is perfect in every way. This song is sure to become song for lovers every where, while it can certainly be used for any country wedding with it’s beautiful soothing light melody. The album continues with “You Get Me That Way,” a fun song about how a girl can affect a guy. Performed in a classic modern country beat, this is sure to be a crowd pleaser when performed live. The album closes as strong as it opens with “A Day In The Life of A Guitar Man.” Performed in a Ray Stevens mixed with Jerry Reed style, this is a wonderful, fun and spirited song that truly captures the essence of being a guitarist. This song has hit Strictly Country’s list of Top Songs of 2014 and like “Picture Perfect,” has earned a nomination for the Spirit Awards Song of The Year Award. Unlike it’s title, Weightless contains the weight of years of studying, research and vast appreciation for the craft of song writing. It contains heart and soul, while delivering a strong message brought forth from each of the songs within. Very few entertainers and songwriters have the unique ability to craft the perfect song. However, Brandon Maddox does as he draws from the strength and knowledge of master songwriters from years past. He is able to create new songs that contain substance with strong lyrics and attention getting melodies. His vocal style is a combination of years of studying legends in music. His musical style contains a mix of classic rock, 1960’s pop and 1970’s heartfelt country. As a man, he is strong willed but quiet. A person who believes in Christian family values, while keeping his spiritual beliefs private. He values the essence of a good song while maintaining the traditions set forth by the legends before him. He understands the business aspect of the music industry, while he writes and performs. He’s not afraid to work hard for what he believes in. But what is more important to him is the person behind the name. What you get behind the name of Brandon Maddox? You get a real man, singing about real events, in a real world with real music. With Brandon Maddox, it’s not manufactured. It’s real and it’s now!